Alfons Nossol is Archbishop of Opole (Oppeln) in Poland since 1977; Professor at the Universities of Lublin , Mainz and now in Opole. Member of the "Pontificum Consilium ad Christianorum Unitatem Fovendam" in the Vatican (Rom). 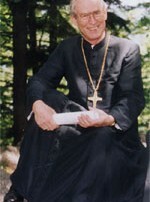 Archbishop Nossol has published 14 books. He was awarded the Dillinger St. Ulrichs Prize in 1993, the Augsburg Peace Prize in 1997 and the Culture Award of the State of Lower Saxony in 2001.